Miniature pens can be a disappointment, as the smaller parts seem to be less durable or less well-designed than their larger cousins. But the Pilot EasyTouch mini pen is solid and reliable as any of it's regularly-sized mates. 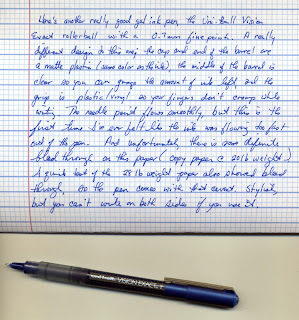 This ballpoint, with a medium point, does glide over the paper and doesn't leave ink smears and splotches. In the pic above the mini (4.5 inches) is compared to a Pilot G2. The mini's large rubber grip is almost as big as the clear barrel, and the clip is thick and substantial. A nice little pen for the purse or pocket. 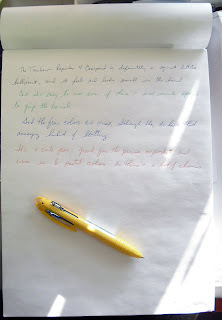 Capless, or Vanishing Point, fountain pens are an interesting cross breeding of ball point and fountain pen. You have the feel of the ballpoint when you push the plunger down and start writing--with a fountain pen nib. I was looking around for a vanishing point and came across a very good deal at the Fountain Pen Network, a pink fine point with an 18k rhodium coated nib, a Con-50 converter and a cartridge cap included. Loved the color, the fine point nib, and the whole idea of a retractable fountain pen, so very shortly the pink one arrived in the mail. It's a lot of fun, pulling out this rose pink ballpoint (very muted color with a soft shine) and then pushing down a fountain pen point. I've gotten a few looks, mostly trying to figure out just what kind of pen I was using. 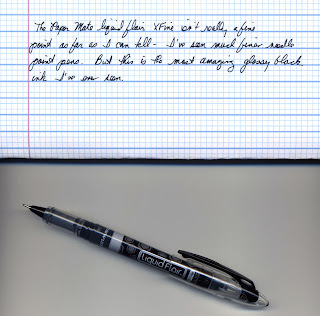 The Decimo is a lighter version of the Pilot Capless, and a very thorough review of the two can be found at at the Fountain Pen Network. For me, it's an interesting pen that combines a fountain pen point with a ballpoint body and system. It's also a very nice writing instrument and keeping to the Pilot standard I've really come to expect. Definitely a nice addition to my fountain pen collection. 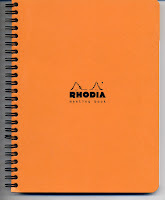 I'd read a bit about the Rhodia Meeting Book but hadn't seen one until a few weeks ago at the Essex Card Shop. Into my basket it went, and sat on my desk waiting for a meeting. When no meeting appeared, I decided to jot down all of the phone calls and different things that come up during the day, much like my planner but with more space for notes and scribbles. And there is a lot of space to make notes and add actions, all on wonderful bright white 80gsm paper with orange accents. This is the smaller planner measuring 6.5 inches by 8.25 inches, and it fits perfectly into bag or briefcase (but not in a back pocket). I've started carrying it around to take notes about different projects such as knitting (can that lace yarn really work in a size 6 needle? ), along with follow ups and other stuff (S. promised to wind the skeins of yarn for me at no charge, even though I didn't buy them at her store). While I'm not more organized I definitely look the part, and sometimes that's all that matters. Like The Pen Addict I really like the Muji gel ink pens, and have a selection of colors in 0.38mm and 0.5mm. So when I saw some on eBay I figured they were nothing special, until I went to look at the color selection. Wine? Plum? Yellow-Green? Hmmm, some different colors not available in the US stores. I ordered the Plum, and as they were comng from Hong Kong the shipping was high but not outrageous. The total cost was about $2.50 per pen, but this is a one-time splurge. The Plum gel ink (the 0.5mm in the pic above) is very close to the Red, I had to look carefully to see the difference. But eventually I realized that the Plum had pink in it while the Red had yellow added in. Love the color and am wondering what the Wine looks like. Since I've been interested in multi-pens lately, I thought I'd check out this Pentel Karen C4 multi-pen, especially as I loved the pastel colors. It's not a bad pen, but it is a ball point and the line is too small for my taste although I normally love 0.5mm gel ink pens. The pen itself is cute but not too cute: the pastel colors are lovely, and the green ink deploys when you press down on the pen clip, which is definitely cute. But I'm just not that into ballpoints, and I couldn't get into writing with this. I'm thinking a gel ink hack is in order, and will have to compare it to my Hi-Tec-C ink refills to get a sense if any will work. Otherwise, into the pen tray it goes for those rare times I need a ballpoint. Simon's Cat sees its first snow. I've ordered several times from Field Notes and received some of their pencils and pens along with my memo books. The recent present also included a pencil, so I thought I'd take a few minutes to actually use it and post a comment. The above isn't the best picture of pencil and scribbles, but it will have to do. First, I love this color scheme. Cedar, black, silver, and mint green are a very pretty combination and so I'd keep these pencils around just to look at them. 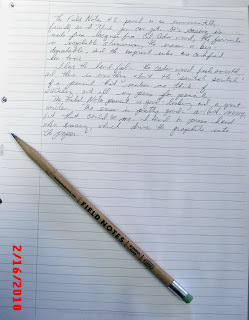 The cedar wood actually gives off a faint smell when sharpened, making me think of early American one-room school houses and general stores--places more likely to use pencils than fountain pens to write out homework and orders. 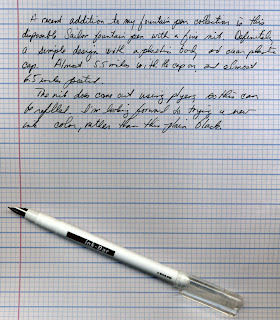 The Field Notes pencil is a standard #2, a wonderful soft graphite and clay mix set in a round (not hexagonal) casing. On one side is the Field Notes logo in black ink (dachshund's nose, I think). The other side has a great "About This Pencil" note: Lacquer-free Renewable Cal-Cedar Wood Casing, Recyclable Aluminum Ferrule, Enviro-Green Degradable Eraser and Certified Non-Toxic Imprint Inks. It also writes, quite well in fact. A keeper, on my desk, for quick notes. The 8th Carnival of Pen, Pencil and Paper will be posted on Pocket Blonde on Tuesday, March 9, 2010. Submissions are due in by Sunday, March 7, and you can do so here. And a few interesting web sites, some you probably know and some that my be new to you. Just received a wonderful present from Field Notes Brand for responding first to a recent Twitter post regarding a photo notebooks belonging to John Hughes in the current Vanity Fair. They sent a ton of good stuff! 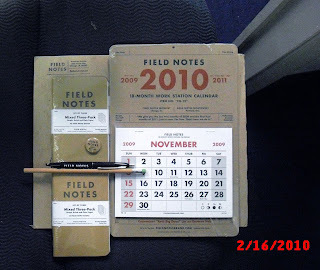 Two packs of Field Notes memo books, an 18 month calendar, a 2010 calendar, a 1-inch pin, a great rubber bank, and a pen and pencil. Interestingly, the two packs of memo books are slightly different in color and size (which can only be seen with nosethisclose to the packs to tell). Several friends will be receiving some great memo books in the next few days, courtesy of Field Notes and the Pocket Blonde Rapid Response Team! 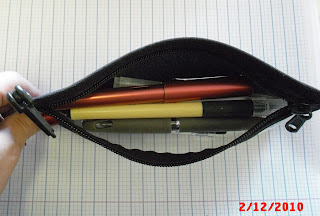 The Organizer is quite roomy, and fits about 7 or 8 pens depending on how chunky they are (like the Lamy). I love the snaphook that let's me attach it to the inside of my tote bag, and the clear front that lets me see what's in the case and where it it. I like this little organizer a lot, and will probably order one or two more. For the price, the quality, and the fun they are well worth it. I didn't specify any particular color when I ordered so they sent this steel-colored organizer. But you can request a color such as Wasabi, Kelly, Navy, Steel, Crimson, Plum, Deep Blue, Sapphire, Olive, Black and the vintage colors of Storm, Pink, Grid, and Cocoa. Here's a cute ballpoint from Tokyo Pen Shop, the Pilot Prismee Ballpoint with a 0.7m tip. I loved the beautiful jewel-like colors, and chose a clear blue sapphire to try out. The pen clip pushes down the ink cartridge and there is a side release to retract it. As far as ballpoints go it's a nice writing pen, definitely looks good, and the colors are pretty. The only drawback is that it cannot be refilled. In the age of recycling, I can't believe Pilot couldn't find a way to make this refillable. As much as I love the design, I'm not planning on buying a replacement when this one is finished. But that won't be for some time, so I'll enjoy the Prismee while the ink lasts. I used to have a lot of fun watching the colors and patters of my kaleidoscope. Now there's a virtual kaleidoscope on the Internet that looks like it is just as fascinating. Today is Fun Ink Day, what color is in you pen? And here's something I found at Pendemonium on ink that is a great read. This seems to be a pen week for me, as I was looking through my case sorting out different gel inks and rollerballs. 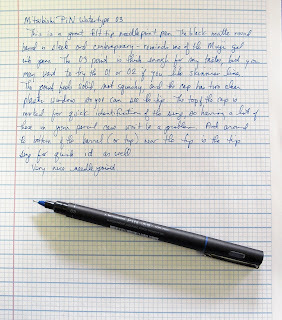 The Uni-Ball Vision Exact is a nice-looking pen, fun and contemporary. The cap and end of the barrel are the same matte plastic color so when it's posted there is one long line of color. The 0.7mm needle point glides nicely and the ink flow is smooth. 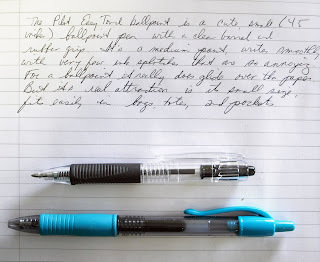 The blue ink seems to be lighter than most blues I've used, making it a bit more distinct in the crowd of gel ink pens It's a looker of a pen and writes well, a great addition to your collection. Hey all, the Carnival is coming--the 8th Carnival of Pen, Pencil and Paper will be here at Pocket Blonde on Tuesday, March 9, 2010. 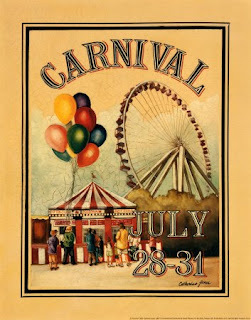 General information about the Carnival is here and the submission page is here. Submissions are due by Sunday, March 7, 2010, and I'm hoping to be inundated with fantastic posts. Many thanks to Nifty for starting the Carnival. There are holes and weird picked-up stitches and some places are too loose, but I love it because I taught myself how to do it by reading a book on how to knit socks. Classes for Beginner's Level 2 have just started, and we're just learning more of the basics, like adding and decreasing stitches. I now know how to knit a sock, gusset, instep, and all. The Paper Mate Liquid Flair XFine Point Marker certainly announced itself to me with it's unique benzene-ring like pattern on the barrel. Takes me back to my organic chemistry days, so I thought I'd try it out. The Liquid Flair features a clear plastic point guard inside the cap that protects the felt tip from damage, and quick-drying, water-based ink that really doesn't bleed through paper. The XFine point isn't quite as fine as they advertise, certainly not like a Zebra Sarasa Stick pen. 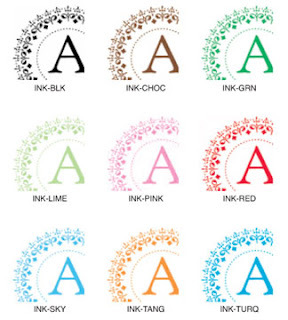 The black ink does flow smoothly and evenly, a feature they promote in their advertising, and it is quick-drying. It's also the glossiest black ink I've ever seen, and I love writing with this pen. You can buy it in basic black, or pick up one of the other colors: blue, green, orange, pink, purple, red, and turquoise. 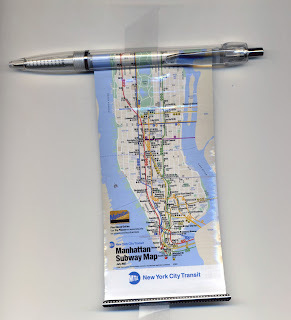 Something really different that I found at the Essex Card shop a few weeks ago, this New York City Transit Manhattan map pen. One side shows the Manhattan subway up to about 96th Street; the other side has the Manhattan bus routes on it. The map easy to use, the pen a regular ballpoint. All in all, a good idea (and not a bad ballpoint, either). I've been looking at this Sailor Ink Bar disposable fountain pen at JetPens.com for some time and decided to get one when I was rounding out a recent order. It's a very basic fountain pen: white plastic body that has a clear plastic panel to show the ink level cap, and clear plastic cap that covers a fine point nib. Ink is black or blue-black, nothing amazing but just a good workhorse fountain pen. But there are some thrills to come. One of the pens I wanted to try from the Tokyo Pen Shop was the Mitsubishi PiN Watertype Felt Tip Pen , a waterproof and fade-proof needle point pen which comes in black or blue ink and in 01, 02, and 03 tip sizes. I chose the blue 03, the largest tip, so I could see how thick the line is on this (someday I'm going to do a comparison of pen lines, just to see how the different sizes actually look next to each other). The Mitsubishi PiN's tip is fairly firm, not squishy, but does have a bit of give to it. The pen is round and matte black, with clean lines that reminds me a bit of the Muji Gel Ink pen. The cap has two clear windows so you can see the tip, which would identify the size if you don't feel like looking at the top of the cap or at the printed number running around the barrel (although the printing is in a medium gray, not really visible on this pen from a foot away). I'm definitely interested in trying the 01 and 02, and will put them on my wish list for the next order. Just an FYI, the Tokyo Pen Shop has now added Nomadic Pen Cases to its lineup, including bright orange. Definitely worth checking out. My FAF Un Bloc Pad arrived last week from Design Within Reach and I had a few quick thoughts, mostly I was surpised and very pleased that this is an Exacompta product. 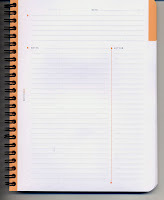 It is a top quality, elegantly spare notepad with a lot of thought put into the design. If you happen to be looking for a stylish and minimalist present for yourself, this is something to consider (maybe in the smaller size, which is more purse/tote/bookbag friendly. The first thing to notice is the packaging: a sturdy presentation box that opens to show off the notepad and it's wrapper, with lots of French to let you know this is one elegant import. Many of the items at Design Within Reach are sleek and unpretentious. Their stores are spare and modern, but they only sell furniture--no paper or notepads. When I stopped by one on West 14th Street I did get to see the small notepad that the sales manager was using, and it is a great size for mobile writing. Anyway, it's available in large and small sizes and the steel back has rubber rounds on it to prevent slipping or damage to surfaces. There are 200 sheets of roughly 10 inch x 10.5inch two-hole paper, held in place by a metal bar and two brass washers. One detail you notice when you take the washers and metal bar off is that the paper is both notched on the side and scored along the length When everything is put back, the side of the metal bar now fits into the notch of the paper, allowing the sheets to be ripped off the notepad smoothly and evenly. Here's another view of the notepad without the metal bar or washers, you can see the scoring along the length and the notch in the side. The top of the steel notepad curves over and acts as a stopper so the paper is even when it is placed in the two metal spike/tacks. Another side view, this time from the front of the notepad. One interesting point that you can see in a few of the pictures above is that the paper has four holes punched into it although there are only two spikes The other two holes are in-between the spikes, and I'm not sure what use they might have. I love that the Exacompta name is right on the metal bar above the left washer. On the right is says "Un Bloc Pad." Put it all together and you get this, a beautiful and functional notepad that turns heads at meetings. The paper is actually better than I had originally thought. It's very light and feels like regular copy paper--definitely not Rhodia or Clairefontaine, but sturdy nonetheless. What was surprising was how much my gel ink and fountain pens liked it. 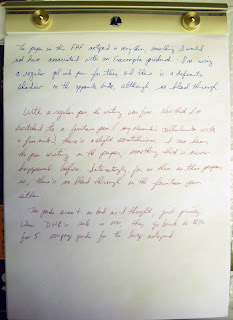 They pretty much glided over he paper with no resistance, although when I was writing with the fountain pen that was the first time I actually heard myself writing. There was a definite shadow on the opposite side but not bleed through, making this paper a good choice for the notepad. I'm not sure if I'll be ordering refills or looking for alternatives. I have a few MiquelRius notebooks that have paper that will fit this with a little tinkering, but it's really not the same. 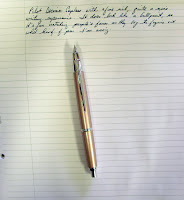 Being a Pilot Namiki fan I thought I'd review The Pilot Custom 74 from my collection, an interesting fountain pen. The Custom 74 has a clear demonstrator barrel and the nib is solid 14K gold with rhodium plating. The tassie (the cup shaped bezel at the end of the barrel), grip and cap are in a contrasting smoke grey resin. The appointments--the clip and trim--are plated in rhodium. The pen can be filled using a converter or ink cartridges, in this case I'm using the onverter and have filled the pen, which has a fine nib, with Noodler's Old Dutch Colony Sepia exclusive to th4e Fountain Pen Hospital. Here's why I find it interesting. Various write-ups mention it's flexible nib, which puts me in mind of the Falcon and Falcon II. But my Custom 74 doesn't flex, it's as hard as a nail. Not only that, it feels scratchy when I write, like a tooth diggining into the paper. I don't know if I've got the bummer of the batch or what, but I'm definitely going to have the nib tamed down. Perhaps into a fine cursive italic, as I've gotten to like my Rotring 900 CI quite alot. Other things of note: it's a lightweight pen, medium-sized, and the smokey grey cap is still clear enough to see ink drops from the nib. I haven't noticed any ink creep on the nib, and other than the scratchiness the Custom 74 writes wonderfully well. The piston converter can be a royal pain but with time and practice you get used to it. I'm not sure this is a great pen, but it's definitely a good one to add to your collection. Especially if you love clear demonstrators, as I do. The Seventh Carnival of Pen, Pencil and Paper is now posted at School Supply Dance. 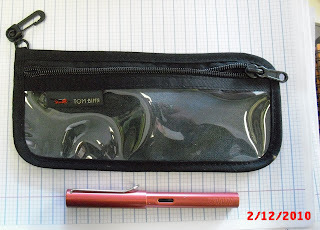 Lots of great posts, and two fantastic Editor's Choices: Julie (Okami) on the Sheaffer Statesman Snorkel and Passion from The Pen Archives compares pencil cases. In addition, Jack's review of the Jinhao Evening Stripes Fountain Pen is also presented. The Eighth Carnival in March doesn't have a host yet, but you can submit your posts here. February 2, known also as Ground Hog Day and Candlemas, is Imbolc in the Wiccan Year--the return of the light, really when you start to notice that there are a few extra minutes of sunlight at the beginning and end of the day. And whether the ground hog sees its shadow or not, Spring is only six weeks away. 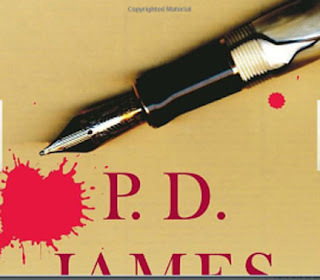 I'm currently reading P.D. James's Talking About Detective Fiction, much of which is about the Golden Age of British detective fiction that is essentially the period between the two world wars. While I might disagree (Richard Jury and Alan Banks, as well as Adam Dalgliesh, immediately come to mind), James dissects the work of the four major writers of that period (and beyond, in some cases): Agatha Christie (who James does not care for and isn't shy about saying why), Dorothy L. Sayers, Margery Allingham and Ngaio Marsh. "The king died and then the queen died" is a story. "The king died and then the queen died of grief" is a plot..."The queen died and no one knew why until it was discovered that it was through grief at the death of the king." This is a plot with a mystery in it, a form capable of high development. To that I would add, "Everyone thought that the queen had died of grief until they discovered the puncture mark in her throat. That is a murder mystery, and it too is capable of high development. And I would add, the Parker Duofold on the front cover is the perfect pen for making that puncture mark on the queen's throat or for writing a mystery story about it. I'm particularly in love with historical whodunits, such as Steven Saylor's Rome Sub Rosa Series. I also love alternative universe mysteries, such as the John Taylor series by Simon R. Green (I've read a TV series is in the works, a la Sookie Stackhouse and True Blood). Of course, now that I'm writing this all my favorites go right out of my memory. Anyone else? 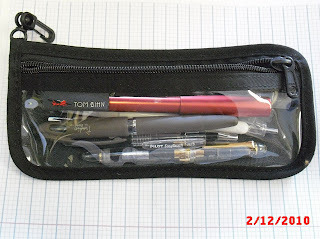 I was looking through the wares at Tokyo Pen Shop and came across this mini multi-pen, the Tombow Report 4 Compact. It looked interesting and I'm a fan of Tombow pens so I popped it into my cart with the other ballpoints and gel inks. The Compact has four oil-based inks in the standard colors: black, blue, red, and green. One particularly interesting feature is that each of the "knock levers" used to push down a cartridge has a different shape to it. After a few uses you'll remember which shape is which color, and be able to choose red (two rounded nibs) by feel rather than sight. 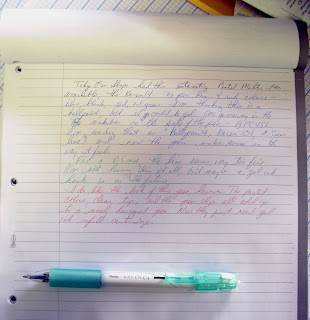 All the inks write quite well, although like any ballpoint there is the problem with ink blots as you write. In this case, the Compact ink dried quickly, so I didn't get the smearing that happens when you run over one of these blots when writing. The pen comes in 6 pastel colors with descriptive names. I chose the "Cheerful Yellow" most likely because I was feeling slightly down that day and thought the Tombow Compact might give me a boost. At $5.50 it's fairly inexpensive for a multi-pen, and while the green and red are a bit light the Compact is a good choice if you like multis and ballpoints.